Appeared in the 1942 Warner Brothers movie “Captains of the Clouds” starring James Cagney. Stored at the Brantford airport after the war, 3399 along with dozens of other Yale’s were sold as scrap to Amsco Ltd. of Hamilton, who then put the aircraft up for sale. 3399 was one of approximately 36 Yale’s purchased by Ernest V. Simmons, who lived south of Tillsonburg. It was later purchased at the estate sale of Mr. Simmons by Don Goddard of Waterloo in 1970. 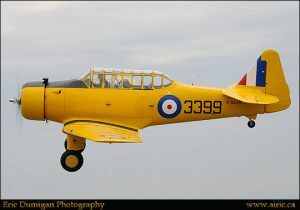 Obtained by CHAA in 1987, the task of restoring the Yale to airworthy condition was assigned to CHAA’s Restoration Wing under the direction of the late ex-RCAF Wing Commander Lou J. Hill. The Yale is dedicated to W/C Hill and the registration, C-GLJH, bears his initials. The first post-restoration flight was on May 20, 2010.